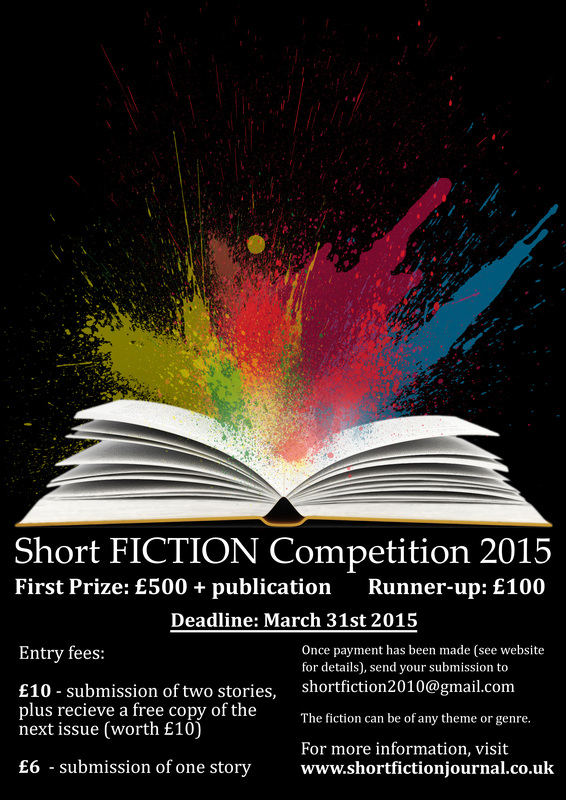 There is just one week left to get your entries in for the Short FICTION 2015 Short Story Prize. Enter up to 2 stories and get a free copy of our next issue. Full details of how to enter can be found by following the link HERE. GOOD LUCK! In our final pre-holiday dispatch, here’s what’s been going on on our blog over the past 2 weeks. Another new publication’s just joined our list – welcome to Taylz: “a free website for short story writers to test and develop their work”. There’s loads to read and many places to send your stories: The Manchester Review has just published Issue 13 and is calling for your submissions. Short Story Sunday gives us a round-up and a festive special. Firewords Three is here, Jotters United has a new issue out and is calling for submissions, and the second issue of Confingo is now on sale. The Emma Press is calling for prose pamphlet submissions. Issue 4 of Holdfast Magazine is live and they are calling for submissions, as is Bunbury magazine, while giving us a peek at what’s been going on over there. Short Fiction journal also wants your short stories. Queen’s Ferry Press is calling for submissions – from lit mag editors – for the first Best Small Fictions anthology. Freight Books wants short story submissons for an anthology inspired by Einstein’s Theory of General Relativity. To celebrate National Short Story Week, 32 young writers have been published in an anthology, on sale now. The Solstice Shorts Festival is approaching. Felixtstowe Book Festival has launched its 2015 short story competition, deadline May 16th. White Rabbit has a new family story-telling show at Knole in December. Story Fridays is calling for submissions on the theme of The 1980s for its January event in Bath. The final month of 2014 has arrived, happy December! A good time for short stories… (isn’t it always?) Here’s what’s been going on on our blog over the past 2 weeks. We’re delighted to welcome a new lit mag, Hotel, to our lit mags list which “seeks to accommodate fiction, poetry and contemporary thought”. Go and visit! There’s loads to read and many places to send your stories: Firewords Three is here, Jotters United has a new issue out and is calling for submissions, and the second issue of Confingo is now on sale. The Emma Press is calling for prose pamphlet submissions. Holdfast Magazinelaunched Issue 4, Diverse Reflections and is also calling for submissions. Bunbury magazine is also calling for submissions and giving us a peek at what’s been going on over there. Short Story Sunday, which has just launched its first issue, is calling for submissions and Short Fiction journal also wants your short stories. Queen’s Ferry Press is calling for nominations for the first Best Small Fictions anthology. Freight Books wants short story submissons for an anthology inspired by Einstein’s Theory of General Relativity. To celebrate National Short Story Week, 32 young writers have been published in an anthology, on sale now. Felixtstowe Book Festival has launched its 2015 short story competition, deadline May 16th. Fictions Of Every Kind is holding its next event, Help Yourself, tomorrow Dec 2nd in Leeds, including an open mic. Word Factory is having its free Christmas Party Dec 13th, in London. Happy National Short Story Week! Here’s what’s been going on on our blog over the past 2 weeks! To celebrate National Short Story Week, 32 young writers have been published in an anthology, on sale now. Find out more about NSSW activities on their website. We welcome the Wales Arts Review to our lit mags list, “the critical writing hub for Wales”. Check them out! The Emma Press has launched a call for prose pamphlet submissions. Holdfast Magazine has launched Issue 4, Diverse Reflections and is also calling for submissions. Bunbury magazine is also calling for submissions and giving us a peek at what’s been going on over there. Freight Books is calling for short story submissons for an anthology inspired by Einstein’s Theory of General Relativity. Short Story Sunday, which has just launched its first issue, is calling for submissions and Short Fiction journal also wants your short stories. Writing Maps has launched its Survival Kit for Writers and its November contest is now open. Word Factory #28 is this Sat night, November 22, in London, featuring a masterclass, short story reading group and live lit event. Fictions Of Every Kind is holding its next event, Help Yourself, on Dec 2nd in Leeds, including an open mic. Ian McMillan, host of BBC Radio 3’s show, The Verb: Cabaret of the Word, dropped by to talk about his favourite short stories. Magic Oxygen’s short story and poetry contest closes on 30th November.